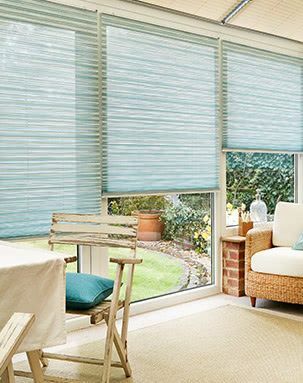 Sleek Roller blinds are the perfect solution for your conservatory. And for hard-to-reach windows, our motorised option is just the thing. Featuring an on-trend colour palette of grey and yellow, this design is a beautifully contemporary fabric with graphic blooms. The option of PerfectFit™ makes it ideal for patio doors too – as we have done here in our dining room. This geometric design is sure to add a fun twist to your room. The clever PerfectFit frames mean you can fit neat and tidy blinds to even the smallest of windows. If you love the seaside you’ll love this fabric. Picturesque yachts set on an aqua background make this design really stand out – we’ve demonstrated it here in a beautifully spacious kitchen-diner. Choosing Roller blinds for the side windows of your conservatory is a smart choice, and we’ve a whole host of options to inspire. Complement the simple design with your choice from hundreds of gorgeous fabrics. Go for a striking or neutral plain, stylish pattern, or go for a practical solution with a sun-reflecting finish. For a really neat solution, try a PerfectFit frame. They’re perfect for the sides of conservatories as no drilling is required – they simply clip into each window frame for a beautifully sleek effect. And you can still choose from our full fabric range. Conservatories are defined by their windows. And that’s where our expert level of service comes in. Your local advisor will show you the full Hillarys range of Roller blinds and offer expert advice. That way, you can be sure you’re getting exactly the right product for your space. For the perfect fit, it can only be made-to-measure. Your local advisor will do all the hard work for you, measuring each window individually and providing you with an itemised quote to consider. Personalise your Conservatory blinds with shaped hems, pulls or poles. Your blinds will be bespoke in every way.